Israel continues to progress little by little. He stays busy resting, making decisions about his house with Cori and going to doctor visits. It has been a month now since they moved back to Palmer from Seattle. At times he feels like he makes one step forward and two back but he continues to remain in good spirits even though progress is slow. He has seen two prosthesis doctors this week and is seriously praying and looking into who he wants to use for his legs prosthesis You can be in prayer for he and Cori regarding this that the Lord will direct their decisions in this matter especially with no funds at the moment and Medicaid not in place. We want to let all of you faithful blog readers know that with Israel’s progress being slow we are going to go to posting on this blog twice a month from now on. If you would like to contact Israel directly feel free to still use that email site on the side of the blog. He reads those daily. Our next post will be December 1st and December 30th . We will maintain these same dates every month and keep you updated on Israel’s life. We could not have made it without all of your support. We really appreciate the time , money and care so many of you have put into Israel . The Lord is good . We are so thankful in this Thanksgiving season to have Israel still with us. It is of the Lord’s mercies that we are not consumed . 1. Thanks to the Lord for sparing Israel’s life in the accident. 10. Most of all , for knowing that we have a Lord and Saviour, Jesus Christ, who was willing to die for us and suffer more pain than we could ever know! 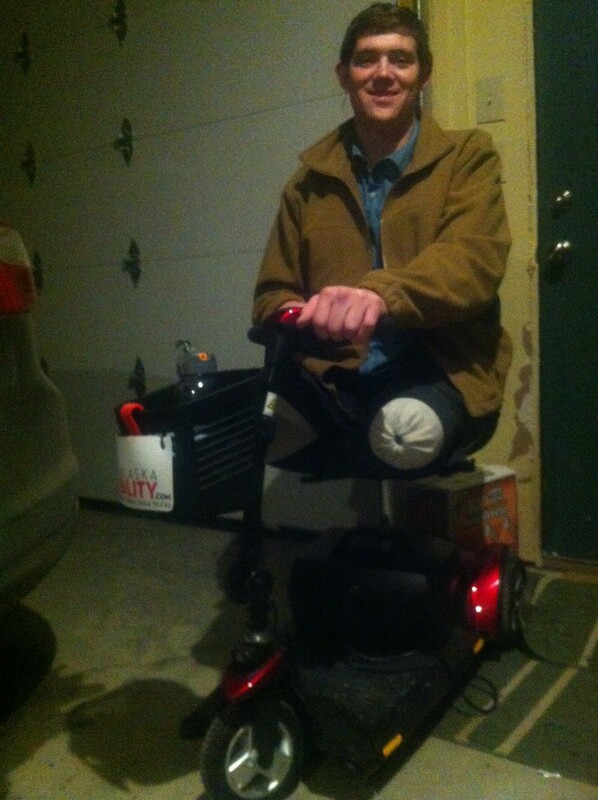 November 10th , Saturday Evening: Israel’s New Wheels! Israel is still pressing on. His recovery is slow but progressing. This has been an exciting week for Israel and Cori as they have been able to use some of the money from the Sunday auction for some necessary things. One of them was a motorized wheelchair that allows him to carry items from place to place, a real need he has felt. He can now make his own coffee, empty the fireplace ashes, and in general move about more freely. He now has two wheelchairs that both have a useful place in Israel’ life. They really appreciated the money also for medications. They have been getting very expensive as they have been in the waiting for Medicaid to come through . In the meantime they have had to buy them all out of pocket. Thank you once again for all of your support and care for Israel and Cori. They continue to keep their eyes on the Lord and are trusting Him. 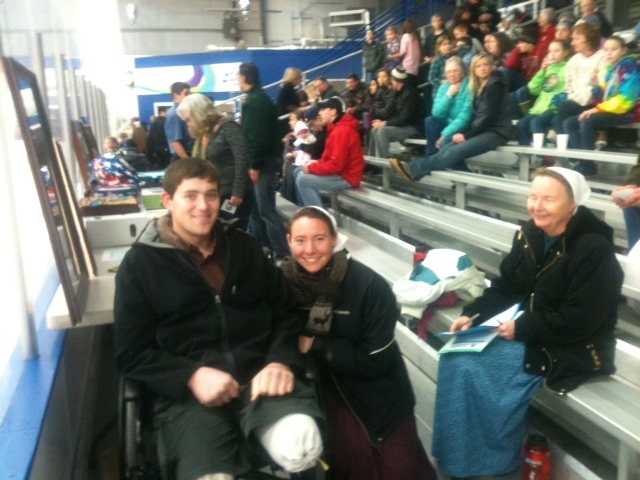 We had a wonderful turnout on Saturday, November 4th at the Ice Skating Rink in Palmer for Israel’s Fundraiser. The community and his family showed their support for Israel and Cori by coming in and seeing he and Cori and participating in the silent and live auction. Israel and Cori came home so blessed , humbled, and encouraged by all of your support and words of comfort and love. Israel did well that Sunday and made it for two hours sitting up, shaking people’s hands,and watching the special hockey team that uses sleds and poles instead of the normal hockey sticks. Monday was a tough day for him after the draining day before and due to some medications problems. Thankfully he snapped out of it and Tuesday he felt better. Today, Wednesday, he went to a doctor’s appointment to counsel with a prosthesis doctor and get some opinions about prosthetics He spent the rest of the day resting. He and Cori are doing well and continuing to press on in hope and trust in the Lord Jesus. Life is not without hope and joy even though there are hard moments. They want to thank you all again for your care and support in these days. The Lord uses a cheerful word and kind gift to bring encouragement to their sometimes tough moments in a day. Israel continues to gain more knowledge into his limitations and abilities. His stomach/ digestive issues have been some of the most challenging lately and up -chucking his food is common. He and Cori are still trying to figure out his medications and what foods he can eat and also how to eat. His teeth also have been giving him a lot of grief as he realizes that he severely bruised them at the scene of his accident when he clenched so hard due to the extreme pain. Any kind of cold foods send him reeling and salad is not an option right now. So along with his leg pain which still gets intense at times along with very painful tremors in his legs he continues to face different kinds of pain. His activity varies from day to day. Some days he is able to do more than others. Today he did something different and went to a local dog show with his wife and little dog , Surprise and had a wonderful time looking at all different types of talents dogs can do. He came home very tired but he had Cori enjoyed their variation of daily life. He’s anticipating seeing many of you tomorrow and hopes that he will feel well enough to come. ” Amid the trials which I meet, amidst the thorns that pierce my feet, one thought remains supremely sweet , Thou thinkest Lord of me. He truly cares for us and never forgets what we are facing and what we are doing.